"...... I want to catch this!...... on so many levels!" Working with @MsMarmitelover was a hoot! Am I the only person who hasn't been there? The front door opens and you feel immediately at home. Everyone who did the kitchen tour after the meal wanted it for their own - it's pretty special. So it was back in June last year when I caught the melanzane parmigiana evening that Shuna Fish Lydon cooked at and it looked so good, I thought 'yes - that would be fun to do', but it had to wait till February - normally the only quiet month of the year (but as it turned out - not so this year). The English Can Cook has been an avid read for a while - it's quite easy to relate to as I also spend all my time cooking in the home environment - although it is other people's home for me. Actually going there though I can see how cooking dishes that you will never see in a restaurant really works there. 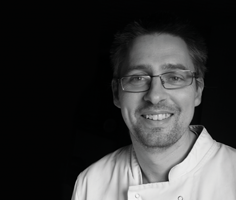 And the theme evenings are great - you just won't find that anywhere else - running a home restaurant gives you a lot more freedom in what you can do. And that's why people love it - and rightly so. Although while some people knew what they were coming to (some even dressed for the part), others had no idea - so a mixed group. If you live in a world where you have Saturday nights off I suppose there is this circuit of home restaurants, and maybe some people book because it's the place to go, rather than doing the homework beforehand to see what the week's theme is. Either way though, everyone ends up having a good time - and that's what its about. 'What about the Patrick O'Brien night?' Ms M had said back in December. Patrick O'Who? He wrote a mere 20 novels centred around the tales of Jack Aubrey in the late 1700's / early 1800's, and food features heavily as their pre-battle meals are always well described. Mmm 19th Century ship's food! Well you can read much more about him here (the pre-meal info) - and it all sounds like a great read. 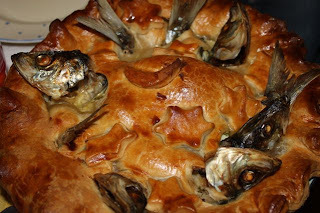 Well I had never made Stargazy pie before. 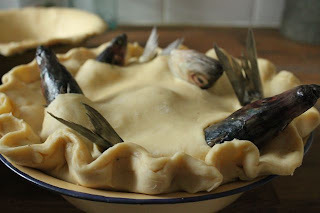 I remembered Helen's langoustine stargazy pie from a while back which was the first time I had come accross it, so I googled a few pics and recipes around midnight the night before as I finished up getting everything ready for the next day in my abscence. Ms M printed off a couple of recipes and we compared those with the recipe in the Lobscouse and Spotted Dog book (the recipe companion to the series of books) and came up with our own. 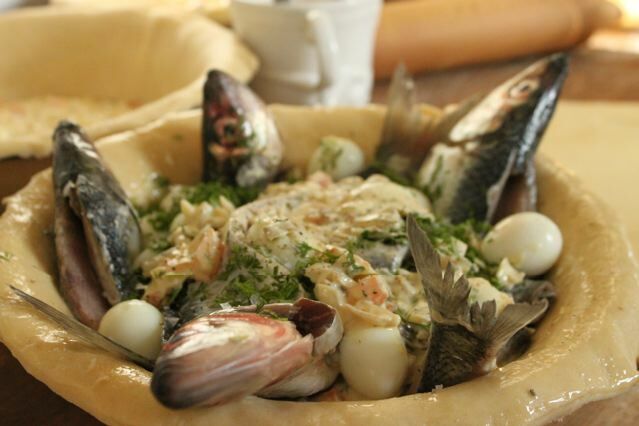 Originally it was made with pilchards, but in fact they have quite a short season, so the pie is also made with mackerel or herrings, which we used. They had already been canoed by the fish monger (de-boned from the top) - so that was a good start. I had brought my trusty pastry recipe with me, so while I got on with making the pastry Ms M went shopping for last minute supplies. As it was so many people I multiplied that by 10 and then did it two halves - by hand. Other various spices on the shelf - there was a really nice homemade curry powder. I built the pies in the enamel dishes previously used at the Brixton pop up - it felt very authentic - with the sauce on the bottom, fish on top and quail eggs (c. 11 per pie) that Ms. M had been peeling. A bit more sauce on top and chopped dill, tarragon and parsley and the pie lid on top. Then you push the fish heads and tails into place under the pastry lid and cut around them so the poke through the top (find out as you go along). But I went into auto-pilot pie mode at this point with crimping the egdes, and as try as I might, I couldn't make the fancy wave patterns - so Ms M took over. 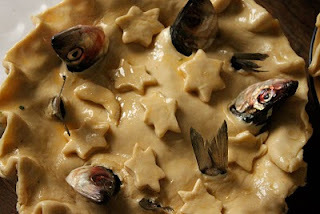 She also thought the stars on top would look good - stars for a stargazy pie. And ever being the astrologist thought a moon would look good too, so I cut one for each pie. What a pie-fest - they looked great lined up on the kitchen table. Just in case there were any vegetarians we made a vegetarian pie too. There were mushrooms in the fridge and garlic bulbs hanging up in the kitchen, so I thought of garlic mushrooms and we used the same cream sauce base as the other pies. Then Ms. M put in the last of the Stinking Bishop cheese from the week before. Yes Stinking Bishop! As there was only one vegetarian in the end there was some left to try afterwards - wow that had to be the tasiest pie in the world..... ever! If you never make a stargazy pie - at least try this one. Meanwhile, while I'd been making the pies, Ms M had been making the boiled baby - a giant boiled (vegetarian) suet pudding -just what you need to keep you going on board ship all day. We just needed a custard to go with it. I pulled one of Nigella's books off the kitchen shelf. Probably similar to this recipe except I put the milk & cream on to heat with a vanilla pod, whisked the yolks and sugar till thick then after the milk had been infusing for 15 mins or so whisked it in to the yolks and put it back on the aga to cook. And Ms M added rosewater - what we used at the time before vanilla. Rosewater custard - it could be a dessert just by itself! While I juggled stargazy pies between top shelves and bottom shelves, top and bottom ovens (aga cooking is fun), it gave Ms M chance to give the intro to the meal to the diners - certainly helped to get everyone in the ship's food spirit, or was that the rum cocktail first? By tickets for the Underground Restaurant here on We Got Tickets. Thanks James. It was so easy working with you...you didn't have that typical chef's reaction of 'where's the professional kitchen gear?' because you are so used to doing guerilla cookery yourself! You have such a light hand with sauces...brilliant! Yes - we'll have to do it again!